During Laser Vein Treatment, a laser is directed towards the afficted area or areas by a certified medical Professional. The laser causes the cells of the non-working vein to heat up, collapsing the vein. It is then absorbed by the body during the natural healing process. 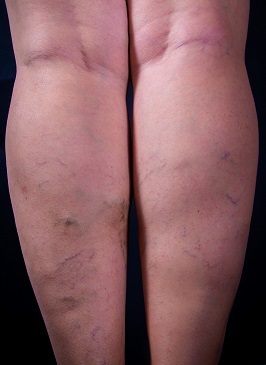 The treatment takes only a few minutes for each vein, and veins treated are destroyed forever. The best part? The procedure is relatively risk-free! The state of the art system provides faster results with fewer visits, making treatment more convenient and affordable. There is no downTime associated with Laser Vein Treatment; most patients can resume normal activities immediately. "The procedures were explained before treatment began. During the treatment I was told exactly what was being done. They always asked if I was alright. The comfort level was excellent and the results very good. I have already recommended this clinic to some of my friends. Dr Aleman and staff are excellent. They all made me comfortable before, during, and after the procedure." ALL INFORMATION IS STRICTLY CONFIDENTIAL. We never sell your name or email address. We value your trust in us.